Andy Montgomery started his day with this 7-04 bruiser and ended it with a 6-06 that advanced him to the Knockout Round. Many of the leaders from the Group A Shotgun Round didn't want to catch a lot of fish in the Elimination Round on day 3 of the MLF Bass Pro Tour event in Raleigh, N.C. Instead, they used their 7 1/2 hours on the water as a quasi-practice day for Saturday's Knockout Round. 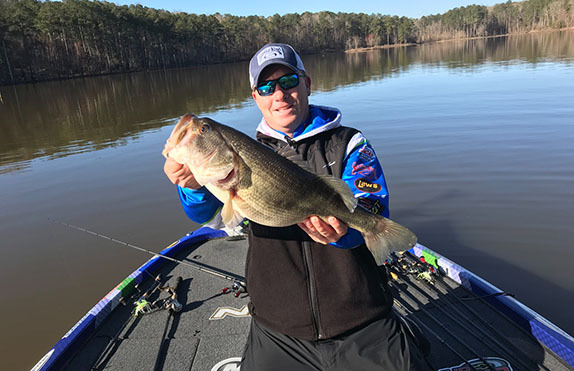 Those who needed to rack up big numbers had a difficult time doing it as the action shifted to Falls Lake, which wasn't nearly as generous in its tour-level debut as Jordan Lake had been two days earlier. There were some bruisers caught, but only two competitors caught as many as 10 scorable bass and the biggest haul of the day was Jared Lintner's 18-12. Kelly Jordon, who boated 26 fish for an eye-popping 82-04 in the Shotgun Round, added 11 pounds to his total on just two bites to finish the early portion of the event with 93-04. That was 21 pounds more than 2nd-place Todd Faircloth, who caught five for 8-10 to conclude with 72-04. The rest of the top 10 consists of Edwin Evers (62-15), Wesley Strader (59-12), Greg Vinson (55-15), Jacob Wheeler (55-07), Randall Tharp (53-15), Mark Daniels Jr. (52-01), Andy Morgan (47-12) and Mike Iaconelli (45-04). Also surviving the cut were Justin Atkins (42-08), Fred Roumbanis (40-07), Tommy Biffle (40-04), Josh Bertrand (38-08), Alton Jones (37-09), Lintner (36-03), Fletcher Shryock (34-13), Andy Montgomery (34-13), Gary Klein (33-06) and Jacob Powroznik (32-14). Falls will host the Group B Elimination Round on Friday and the Knockout Round the next day before the event concludes at Lake Shearon Harris with Sunday's Championship Round. Most believe the action at Falls will improve over the next two days as the weather continues to warm and more big females continue their progression toward the spawn. Montgomery staged the most dramatic late-day rally, catching a 3-pounder and a 6-06 with less than 10 minutes left to jump from 32nd place to 18th. He boated a 7-04 earlier in the day and compiled his two-day total on just eight fish, which was fewer than the number caught by 11 of the 20 competitors who failed to make the cut. 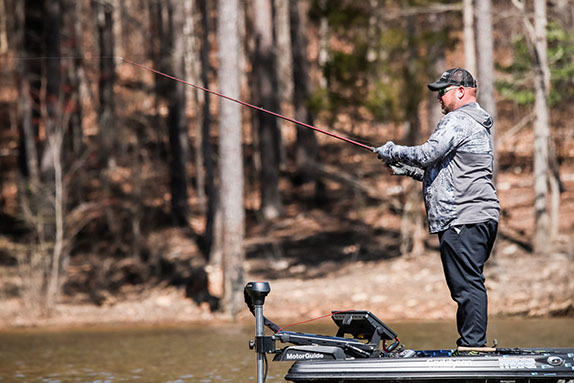 "That big one I caught early got me inside the top 20 and I thought I could do enough to stay there, but then I went about 6 hours without a bite," said Montgomery, who started the day in 26th. "I kept trying to force what I'd done on my practice day, but in the last 20 minutes I made an adjustment and it paid off. "I went from kicking rocks to thinking that now I've got a really good chance to make the Championship. "(The Knockout Round) is still two days away and with the warmer weather things are going to change again, but I'm a lot more confident." Powroznik, who gained 12 places in the final period to claim the final cut position, caught four of his five fish for the day in that stanza. That quartet included a 4-06 specimen. Jacob Powroznik moved up 12 places in the final period to claim the last position inside the cut. "I lost a really good fish this morning on a flat-sided, handmade crankbait and I should have known right then that's what they wanted, but I put it down and didn't throw it anymore. There wasn't much wind and at this time of year on these lakes, wind is your friend. In my mind, I thought I needed to throw a jig or a little shaky-head or something like that. "I finally realized that if the one I lost would eat it, some others probably would, too. At 2:15 I picked it up and caught that 4 right away. They're still not biting good here � you can tell by the weights � but it's about to bust wide open. It could be really good Saturday and Sunday." Klein caught a 2-03 with three minutes left to get inside the cutline. Michael Neal, who'd popped a 4-03 a few minutes earlier to break into the top 20, ended up being the first angler out after the flurry of late catches. Others who narrowly missed out were Luke Clausen, John Murray, Gerald Swindle, Kevin VanDam and Brent Ehrler, who were all within 2-01 of Powroznik's total. Jordon said the two fish he caught � a 6-01 and a 4-15 � were basically accidents. He'd have preferred to not have hooked either with the hope that he could utilize them in the Elimination round. "It was painful catching those because I really didn't want to catch any," he said. "I ran more stuff and tried some different patterns deep, shallow and in between. I caught both of those fish practicing; it's just really hard to get a lot of bites right now at Falls. "As far as I know, there's not a fish much under 5 pounds in the whole lake. The day I practiced there, the smallest I saw was 6 1/2. It reminds me of that old song, 'When You're Hot, You're Hot.' I didn't fish anywhere today that I thought I was going to fish on Saturday. I have a couple zip codes that have a few fish and that's what I'm most excited about. Confidence goes a long way in this one." Daniels, who started the day in 4th place, succeeded in not catching anything and fell only four places. "I was just poking around trying a bunch of stuff. I wanted to see if I could stumble onto some developing patterns or anything like that. I shook off the three bites I had and that was about it. The areas where I got bit in practice, I didn't go to those. "The weather's different, but the water clarity still looks the same (as it did on Sunday) and the temperature has risen a few degrees. It's definitely a different place than Jordan � totally different." An 8-12 caught by Atkins took big-fish honors or the day. Evers, the winner of the previous event at Lake Conroe and the leader in the Angler of the Year race, had an 8-07. The following anglers did not make the cut and will not advance to the Knockout Round.